As a parent I can tell you with absolute certainty, discipline is one of the hardest things to figure out. It's also the topic that generates the most discussion and controversy. That's why I'm glad Michelle Anthony, in her book Spiritual Parenting, reminds us what the Bible says about this important topic. The greatest news of all is, it doesn't matter what side of the discussion you fall on. What she shares applies across the board. Anthony wraps up this chapter this way, "Course correction is a loving, respectful, - and productive - way of dealing with our children's misdeeds." (pg. 170) We all know our kids are going to make mistakes, the real question is how are we going to handle them? Parents, Are Your Kids too Comfortable? As parents we desire to protect and provide for our kids. It's a natural tendency which to a certain extent is a very good and healthy thing. But what happens when we make things too comfortable for our kids? How do we know when we've gone too far? When we try to overprotect we are potentially trying to interfere with what God is teaching them. We see throughout Scripture that God uses trials to grow the faith of His people. Michelle Anthony goes on to explain that the by-products of such trials are, "... perseverance and mature faith." (pg. 124) Isn't this what we truly desire for our kids? How else will they learn to live in a sin-soaked world. 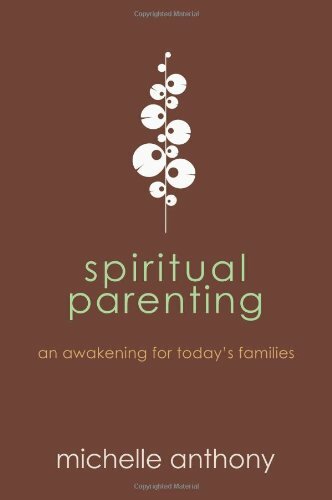 All quotes taken from Spiritual Parenting: An Awakening for Today's Families by Michelle Anthony © 2010 and published by David C. Cook.